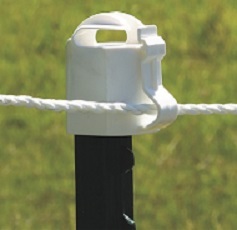 Temporary & Electric Fencing Insulators Outriggers Extends life of woven or barbed wire by creating an electric wire "off" of the traditional perimeter fence. 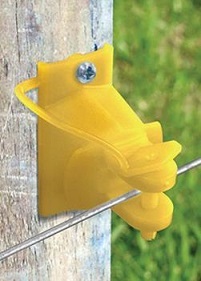 Temporary & Electric Fencing Insulators Rod Post Yellow. Screw on rod insulator. Use on polywire, 1-1/2in. polytape, polyrope, steel/aluminum wire. 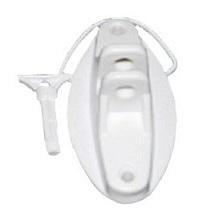 Made from quality plastic and porcelain materials. UV Stable. Fits posts 1/4in (6mm) to 9/15in (14mm) in diameter. 5 YEAR WARRANTY! 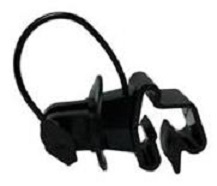 Temporary & Electric Fencing Insulators T-Post Black. 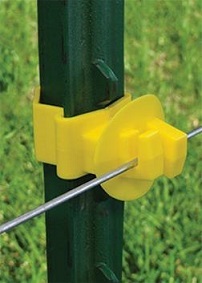 Quick and easy solution to connect electric fence wires, polytape to T-posts. 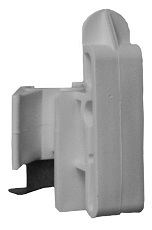 Excellent arcing protection to reduce shorting. UV stable and designed for long life. 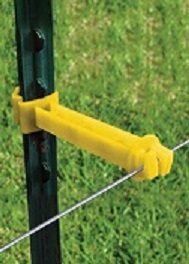 Temporary & Electric Fencing Insulators T-Post Yellow. 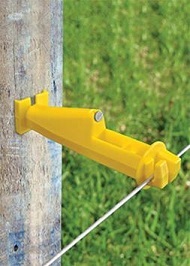 Quick and easy solution to connect electric fence wires, polytape to T-posts. Excellent arcing protection to reduce shorting. UV stable and designed for long life. 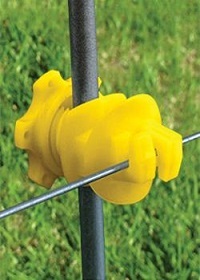 Temporary & Electric Fencing Insulators T-Post Yellow. Claw design. 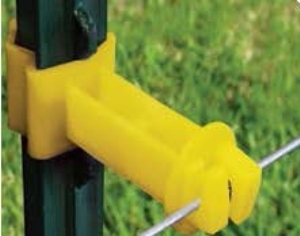 Protects existing fence by extending the electric wire off the T-Post. 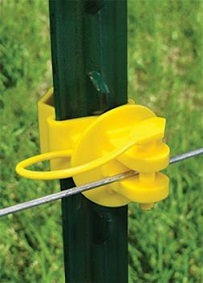 Temporary & Electric Fencing Insulators T-Post Green. 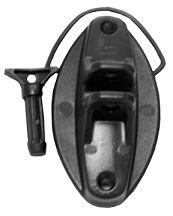 Pinlock allows for easy wire removal. Works with multiple T-Post diameters, wood posts, or metal pipe posts. Sturdy pin for longer life.Reinforced jaws. UV stabilized for long life. Not recommended for coated wire such as PM 762HC or 762HC-B. 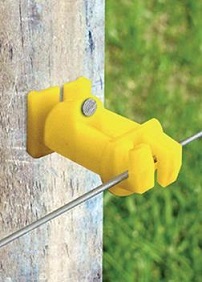 Temporary & Electric Fencing Insulators Wood Post Yellow - Nails Included. Temporary & Electric Fencing Insulators Wood Post Works great with Hi-Tensile, Polywire, Polyrope, Polybraid, and HotCote Wire! Made in the USA. 10 year warranty. Black. 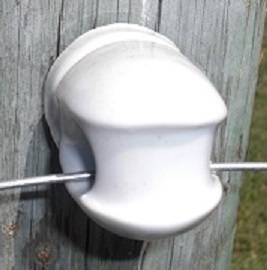 Temporary & Electric Fencing Insulators Wood Post Provides insulation for wire stretching across wood posts. 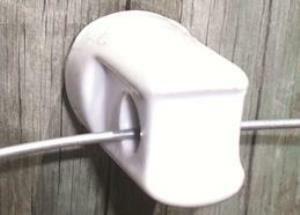 Temporary & Electric Fencing Insulators Wood Post White. Larger spacing works great with Hi-Tensile, Polywire, Polyrope, Polybraid, and HotCote Wire! Made in the USA. 10 year warranty! 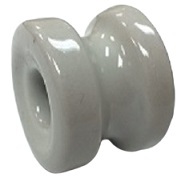 Temporary & Electric Fencing Insulators Wood Post For all Ring Insulators and Maxi Tape Insulator. Use with PM229 Wood Post Screw-In insulator.